The cheerful and likeable prince of a neighboring kingdom. He met Princess Aurora when she was still living in the forest. Maleficent imprisoned him to prevent his and Aurora's reunion, but the three good fairies rescued him. In the end, he defeated Maleficent in dragon form and, with true love's kiss, woke Aurora from her slumber. "To prevent me from breaking her evil curse. I was to meet the most beautiful girl at a cottage in the glen, but now my true love lies in an eternal slumber...and only I can break the spell." 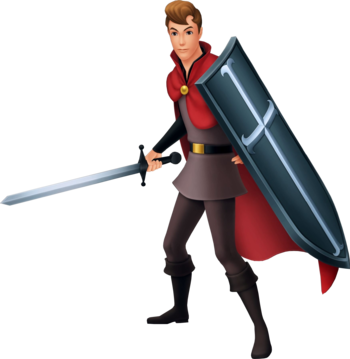 Prince Phillip is an ally in Kingdom Hearts Birth by Sleep and a non-player character in Kingdom Hearts Union χ in Enchanted Dominion. Betrothed to Princess Aurora upon her birth in the corresponding Disney movie, Sleeping Beauty, he becomes an ally to Aqua when she visits Enchanted Dominion. Prince Phillip is accompanied by his horse Samson. Prince Phillip has had a dream of his betrothed Princess Aurora since before their encounter in the forest, although he was unaware of her identity at that time. Aurora readies to flee home, but Phillip asks to see her again, and she tells him to meet her at her cottage. That night, he visits the cottage and falls right into Maleficent's trap after the princess's curse came true. Sometime later, Aqua, a Keyblade master, becomes captive as well. The three fairies, Flora, Fauna, and Merryweather, descend to rescue the prince and the Keyblade master after Ventus released Aurora's lost heart from Maleficent's clutches. Together, they transcend to King Stefan's castle to awake the princess from the spell. However, Maleficent appears before them and engages them in battle, in the form of a monstrous dragon. Aqua and Prince Phillip come together to fight the witch, but when Aqua gets blocked by a wall of flames, Phillip is forced to face her alone. The fairies enchant his sword, allowing him to defeat Maleficent. With Maleficent's magic weakened, Prince Phillip makes his way to the princess and breaks the spell with a true love's kiss. After the battle with Xehanort at the Keyblade Graveyard, the prince is seen dancing with Aurora in the audience chamber of the castle. Disapproved by their respective colors, Flora and Merryweather continuously change the colors on Aurora's dress with magic. Prince Phillip is a thin young man with wavy, brown hair and black eyes. He dresses in a grey tunic over a high-collared, long-sleeved black shirt. He wears a black belt with a gold buckle around his waist, over the tunic. His pants are dark grey and he wears knee-high, black boots. He also wears a long, red cape with a high collar, fastened by a golden, circular pin. He wields a sword with a black guard and handle, as well as a long, thin shield that is grey with a silver cross decorating it. Prince Phillip is the valiant lover of Princess Aurora. As such, he is fearless and quick to oppose any who threatens his love, such as Maleficent. Prince Phillip is also quite strong, being a gifted swordsman. Such combat skill is also recognized by his ability to defend himself against Maleficent's minions, as well as defeating the fierce Maleficent in her dragon form. Phillip can assist Aqua with the command "Selfless Prince" by pressing the button when prompted. He throws her into the air and pressing at this time makes Aqua do a powerful diving attack. The two use this attack to knock down walkways in Maleficent's Castle so Aqua can access the wheels to open the gates, and during the boss battle against Dragon Maleficent to throw Aqua onto Maleficent's back and to knock Maleficent crashing to the ground. First appearing in Disney's Sleeping Beauty, Prince Phillip is the only son of King Hubert. Attending Princess Aurora's birth ceremony, Phillip was to be her husband so as to unite the kingdoms of King Hubert and King Stefan, Aurora's father. Once the girl took on the alias of Briar Rose and lived as a peasant woman in the forest, however, the two met for the first time in 16 years. They grew fond of each other, Phillip wishing to see Aurora once more. They arrange a meeting at the girl's cottage, Phillip meeting a trap set by Maleficent instead. The noble prince held captive by the witch, he escapes via Flora, Fauna, and Merryweather. Destroying the vengeful witch in her dragon form with the Sword of Truth, he broke the curse set on Aurora, marrying his princess at last. In the film, Phillip is notorious for having very few lines, speaking only during the first half of the movie and then becoming completely mute during the second half.